This was absolutely beautiful, a gift for my Daughter who loves her bling. Burgi makes fabulous watch's. I have several and I love all of them This has a silver mesh bracelet and a bejeweled face that is just gorgeous. 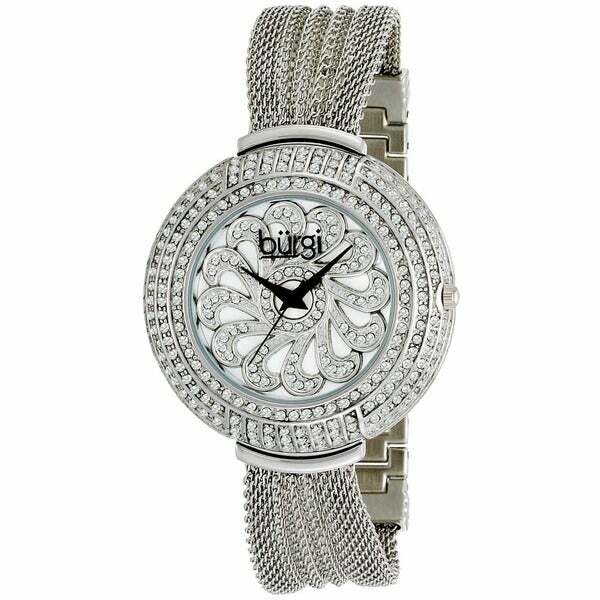 This exceptional, Burgi women's, dazzling, crystal, quartz watch is perfect for any occasion. The bezel features genuine crystals with a sunray and flower pattern dial. This watch looked better on the computer than in person. Bought one for my mom several years ago in gold tone. It was really pretty and still looks good and keeps time well. Would buy that one again but the silvertone did not look good to me. Also it takes a large wrist even if one link is removed. I almost bought 2 watches when I saw this one. Great watch for evening as well as day time. I kept the Mavado but am considering ordering this one again to use for evening wear. It is so different! exquisite, great price, looks fab! "I have a very small wrist. Can you give the size of the band?" It measures 8.5 inches long.